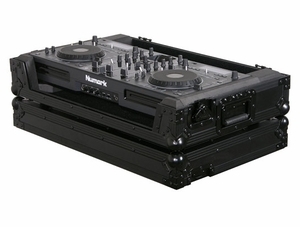 Protect your Numark MIXDECK DJ Controller in our FZMIXDECKBL ATA Black Label� Series flight cases. Functional and cool, the FZMIXDECKBL's exclusive patent pending bevel foam interior angles up nicely displaying the MIXDECK controller for an efficient control surface. The stylish V-Cut removable front panel allows for easy access to the MIXDECK's front controls, headphone/mic jacks, and disc slots. A spacious ventilation pit under the MIXDECK is also great for storing cables and other accessories. Feel safe and proud transporting your valuable gear with the guarantee of Odyssey's industry-leading designs. Also available in the standard black on Chrome hardware Flight Zone� Series (FZMIXDECK), and with Odyssey's patented Glided Style laptop/gear platform (FZGSMIXDECK, FZGSMIXDECKBL).